Many publications post pictures and descriptions of the clubs used by professionals called What’s In The Bag, or WITB. It’s a great way to see what the “big boys” use to shoot the low numbers they do. Here are a few WITB observations to keep in mind. One thing I notice is when a player still uses an older club as opposed to the latest model. Does this mean that club is better than the new stuff? Not necessarily. Remember that these are the best players in the world. More often than not, they hit the ball in or near the center of the clubface. Therefore, forgiveness isn’t a big factor for them when considering clubs. The deciding factors are often the look of the club and what works for them. Another consideration they have is familiarity. Players may have the same clubs in their bag from early in their career. They know exactly how the club feels and performs for them. Another observation to note is what I call the “fine print.” While the brand and model of the club is stated up front, you have to read a little deeper to find important details. Weight and shaft length are just two things players will customize. For example, a Golf Digest article stated Sergio Garcia adds 30 grams in the grip section of his irons. The extra weight gives him the feel he prefers. Another common thing seen is driver and fairway wood shafts that are tipped, or cut from the bottom. These shafts play stiffer than those off the rack. This is done to control ball flight and spin characteristics. Finally, Tour players often have equipment not available to the general public. Jason Day, for example, plays a shaft built specifically for him by True Temper called the Dynamic Gold X7. The X7 has been described as a Dynamic Gold X100 on steroids. The Dynamic Gold X7 shafts are stiffer, heavier, and designed for strong golfers with abnormally high club head speeds. “Tour Only” putters are another common sight on these lists. Manufacturers design and build putters to fit a particular player’s eye and stroke. Next time you are looking at a Whats In The Bag article, keep these important thoughts in mind. 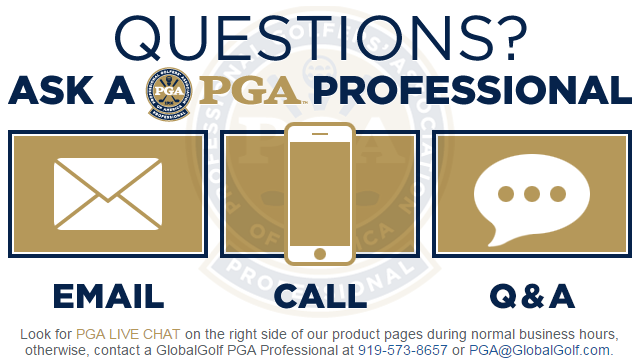 Contact one of our PGA professionals for help making sure you have the best equipment for your game. ‹ What Makes The Callaway GBB Epic Sub Zero Driver So Cool?